The citrus longhorned beetle (CLHB), Anoplophora chinenis (Forster), is a serious pest of citrus in China but did not occur in the U.S. until it was detected in a Washington nursery in 2001. An eradication program was immediately implemented in Washington and there have subsequently been no new infestation reports (Anonymous 2005). However, with the increasing global trade and movement of plant materials, there is an imminent risk of establishment of CLHB in new areas. With a host range of more than 40 hardwood species, CLHB is a potential threat to natural areas as well as fruit trees and woody ornamental plants (Anonymous 2002b). Unlike many other native borer pests that primarily attack dead trees, CLHB attacks apparently healthy trees (Chambers 2002). Once established, it can be extremely difficult and expensive to eradicate. A closely related species, the Asian longhorned beetle, Anoplophora glabripennis (Motschulsky) caused the destruction of thousands of trees in New York and Chicago and cost $369 million for eradication efforts (Anonymous 2005). Figure 1. Adult citrus longhorned beetle, Anoplophora chinensis (Forster). Photograph by Washington State Department of Agriculture Archives; www.forestryimages.org. The genus Anoplophora was most recently revised by Lingafelter and Hoebeke (2002). The authors synonymized Anoplophora malasiaca (Thomson) with Anoplophora chinensis. The following are other scientific names used for Anoplophora chinensis by earlier workers (Lingafelter and Hoebeke 2002, CABI 2004). CLHB primarily occurs in China, Korea, and Japan but it is also found in Taiwan, the Philippines, Indonesia, Malaysia, Myanmar, and Vietnam (CABI 2004). In North America, except for interceptions at various ports of entry, there were no records of established populations until local infestations were detected for the first time in Tukwila, Washington on maple trees (Acer) imported from Korea (Grob 2003, Lingafelter and Hoebeke 2002). Since then, eradication measures were taken and quarantine regulations imposed. As of 2005 there were no reports of new infestation (2005 Updates). Prior to the localized Washington population, a single adult CLHB was intercepted in 1999 at a nursery in Athens, Georgia, on a shipment of crepe myrtle (Lagerstroemia) bonsai from China (Thomas 2004). An interception of citrus longhorned beetle in Wisconsin has also occurred (Chambers 2002). Adult: The beetle is large, stout, and approximately 21 to 37 mm (~1 - 1.5 inch) long with shiny black elytra marked with 10 to 12 white round spots (Lingafelter and Hoebeke 2002). Males are generally smaller than females, and have their abdomen tip entirely covered by the elytra, in contrast to the partially exposed abdomen of females (Lieu 1945). Also, the male elytra are narrowed distally compared to the rounded female elytra. Another difference between males and females is antennal size. The male's antennae are approximately twice as long as the body when compared to the female's antennae which are only slightly longer than the body. Each segment of the long, 11-segmented antennae is basally marked with white or light blue bands. The anteriorly and posteriorly narrowed pronotum has a pair of stout spines extending from its sides. The base of the elytra has numerous short processes (tubercles) called granulae, a morphological character that may help to differentiate CLHB from the Asian longhorned beetle, Anoplophora glabripennis. Egg: The egg is 5.5 mm (0.22 inch) long and 1.7 mm (0.07 inch) wide, elongate, sub-cylindrical, smooth-surfaced, and tapering at both ends; it is initially creamy white but gradually turns yellowish brown when ready to hatch (Lieu 1945). Larva: The legless larva, which is 5 mm (0.2 inch) long at the time of hatching, grows to a size of 52 mm (2 inch). It is creamy white with some yellow, chitinized patterns on the prothorax. Pupa: The pupa is 27 to 38 mm (1 to 1.5 inch) long; it has elytra that only partially covers the membranous hind wings and curves around to the ventral surface of the body. In China, CLHB is known to emerge from April to August but is most abundant from May to July (CABI 2004). Soon after emergence, the adult feeds on leaves, petioles, and bark of twigs of preferred host plants. Most activity, including feeding and mating, occur during the day. Eggs are deposited under the bark through a T-shaped oviposition slit made at the base of the trunk or exposed roots. Under rearing conditions, Lieu (1945) observed an average fecundity of 15 eggs, but some sources mention that a single female is capable of laying as many as 200 eggs (Anonymous 2002b). The young larva hatches out in one to three weeks and initially feed on the green, sappy portion of the inner bark. During its later instars, the larva makes irregular tunnels in the wood, and continue to do so until pupation. The pupal stage lasts for four to six weeks until a pre-adult is formed with the final molt. The pre-adult is inactive and takes about one to two weeks to mature and emerge out of the tunnel. CLHB takes approximately one year to complete its development (CABI 2004, Lieu 1945). Figure 2. Exit hole created by the emergence of an adult citrus longhorned beetle, Anoplophora chinensis (Forster). Photograph by Washington State Department of Agriculture Archives; www.forestryimages.org. The citrus longhorned beetle is a polyphagous pest attacking living trees of over 100 species. It is a pest of major concern for citrus growers in parts of China. Its primary hosts include, lime/lemon/oranges/tangor (Citrus), trifoliate orange (Poncirus trifoliata), apple (Malus pumila), Australian pine (Casuarina equisetifolia), poplars (Populus), and willows (Salix) (CABI 2004). However, it attacks a wide range of trees and shrubs in 26 different families and more than 40 genera. maples (Acer), silk tree (Albizzia), alders (Alnus), birch (Betula), Camellia, hickory/pecan (Carya), chestnut (Castanea), Japanese cedar (Cryptomeria), wild olive (Elaeagnus), loquat (Eriobotrya japonica), beech (Fagus), fig (Ficus), 'Nagami' kumquat (Fortunella marginata), ash (Fraxinus), mallow (Hibiscus), holly (Ilex), walnut (Juglans), spicebush (Lindera), amur (Maackia), mulberry (Morus), Photinia, sycamore/plane tree (Platanus), trifoliate orange (Poncirus trifoliata), poplars (Populus), cherry/peach/apricot/plum (Prunus), firethorn (Pyracantha), pears (Pyrus), oaks (Quercus), sumac (Rhus), locust (Robinia), rose (Rosa), blackberry/raspberry (Rubus), willows (Salix), pagoda tee (Sophora), Stransvaesia, snowbell tree (Styrax), and elm (Ulmus). The majority of damage associated with CLHB is caused by the larval stages which feeds and tunnels on the woody portion of the host plant trunk. The wounds created during the course of feeding increase the host susceptibility to various secondary plant pathogens. Later instar larvae have stronger mouthparts and are able to burrow deep into the wood and create irregular tunnels that interfere with the water and nutrient transportation resulting in rapid tree decline. As compared to the younger trees, older trees with larger trunk diameters are able to sustain more damage. Although adults do feed on leaves, and bark of twigs, the damage is usually not considered severe. Natural control. CLHB larvae are most susceptible to natural enemies in the early larval instar stage, or approximately the first two months of development. In China, predation by the weaver/red ants, Oecophylla smaragdina (Fab.) prevented the need for chemical control (Lieu 1945, Yang 1984). Sanitation. Field sanitation including cutting and burning/chipping of infested plant parts can eliminate immature stages. Mechanical exclusion. Since eggs are laid under the bark at the base of the trunk, wire nettings or spiral guards at the trunk base can serve as physical barrier for female oviposition. Biological control. The pathogenic fungi Beauveria brongniartii (Sacc.) is known to cause high adult mortality. In Japan, studies demonstrated adult mortality of 46 to 100% when sheets of polyurethane forms impregnated with Beauveria brongniartii were wrapped around the lower portion of the trunk or hung from the crotch (CABI 2004). Chemical control. 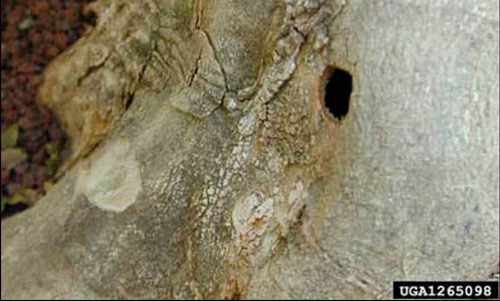 Systemic insecticides are injected into base of a tree from where it is circulated to the branches, twigs and foliage. The tree injection has been a successful component of the Asian longhorned beetle eradication program and imidacloprid was recommended for use during the eradication program for CLHB (WSDA 2002, Anonymous 2002b). Both adults and larvae are exposed to insecticides when treated by tree injection. Monitoring and reporting. An integrated approach including extensive surveys, surveillance, tree removal, chemical treatment, and regulated movement of potential host plant species out of the quarantine areas is required for a successful CLHB eradication program. Recently, a male attractant pheromone has been identified that could be useful tool for monitoring program (Hansen et al. 2015). Since CLHB is a regulated pest, any suspect sample should be sent to your local State Department of Agriculture or USDA-APHIS for advice and action. Your local Cooperative Extension Service can also assist you with identification questions. In Florida, specimens should be submitted to the Division of Plant Industry (Thomas 2004). Anonymous. (2002a). Longhorned Beetle Quarantine Language (adopted April 17, 2002). Washington State Department of Agriculture. (No longer available online). Anonymous. (2002b). 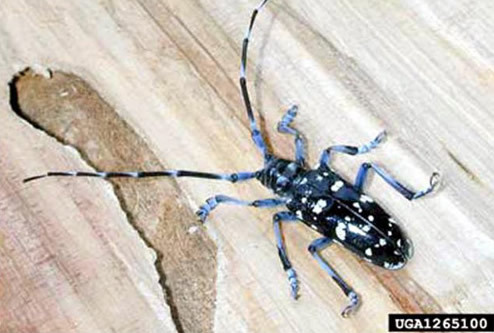 Washington's tree slayer: The citrus longhorned beetle. Citrus longhorned beetle eradication project. Washington State Department of Agriculture. (No longer available online). Anonymous. (2005). Citrus longhorned beetles found in Tukwila. http://www.ci.tukwila.wa.us/beetle.htm (20 July 2018). CABI. (2004). Crop Protection Compendium. http://www.cabicompendium.org/ (20 July 2018). Chambers B. (2002). Citrus longhorned beetle program, King County, Washington: Environmental Assessment, April 2002.https://www.aphis.usda.gov/plant_health/ea/downloads/clb.pdf (20 July 2018). Grob JA. (2003). The beetle battle. http://www.sciam.com/article.cfm?articleID=0000260C-5A10-1E56-A98A809EC5880105&sc=I100322 (20 July 2018). Hansen L, Xu T, Wickham J, Chen Y, Hao D, Hanks, LM, Millar JG, Teale SA. 2015. Identification of male-produced pheromone component of the citrus longhorned beetle, Anoplophora chinensis. PlosOne https://doi.org/10.1371/journal.pone.0134358. Lieu KOV. 1945. The study of wood borers in China -- I: Biology and control of the citrus-root-cerambycids, Melanauster chinensis, Forster (Coleoptera). Florida Entomologist 27: 61-101. Lingafelter SW, Hoebeke ER. 2002. Revision of Anoplophora (Coleoptera: Cerambycidae). Entomological Society of Washington, Washington, DC. 236 pp. Thomas MC. (2004). Citrus Longhorned Beetle (CLB), Anoplophora chinensis (Forester). FDACS-DPI Pest Alert. https://www.freshfromflorida.com/content/download/66179/1598450/Anoplophora_chinensis_-_Citrus_Longhorned_Beetle.pdf (20 July 2018). WSDA. (2002). Citrus longhorned beetle eradication project: Tree injection: Another weapon against the Citrus longhorned beetle. (No longer available online). Yang P. 1984. The application of Oecophylla smaragdina Fabr. in South Fujian. Fujian Agricultural Science and Technology, No. 5:23-25 (CAB abstracts). Publication Date: September 2005. Revised: July 2018.